It’s been a busy two weeks for the Civic Fellows, full of good music, good people, and good times! We’ve been digging in to our CSO-Connect project and things are taking shape nicely thanks to a pair of workshops. The first workshop was with Brenda Fineberg, a former CSO teaching artist and program director at Foundations of Music. The second workshop was with David Wallace, a former New York Philharmonic teaching artist and professor at the Berklee College of Music. Both pushed us to think creatively about ways to get the students involved and participating in the music-making process. We have now adapted several of these activities and are excited to get the students performing (and even composing!) music with us. As fun as these CSO-Connect rehearsals have been, there have been a lot of them. But thanks to our trumpet Alex Schwarz and his family, the fellows got a once-in-a-lifetime chance to spend a weekend retreat in BALMY Wisconsin. Alex’s family recently moved to Wisconsin and graciously offered to host the fellows for a potluck dinner and slumber party. Food, drinks, and games in the evening. We were able to catch a few Zzzs in our sleeping bags and in the morning we went on a beautiful little hike. The night was just what we all needed after many long rehearsals! ABOVE: The fellows enjoying some well-earned R&R in WI. Back in the city we were all amped to start working on our first concert cycle of 2018, under the direction of Maestro Rafael Payare. The repertoire included two demanding works: Bartok’s Miraculous Mandarin Suite and Mahler’s Symphony No. 1. Maestro Payare was a powerhouse on the podium and the orchestra was very excited to work with him. After the concert, we were lucky to join the Maestro and his wife, acclaimed cellist Alisa Weilerstein, at the Women’s Board backstage reception. As if one Mahler symphony wasn’t enough, the following week we all got to read Mahler’s Symphony no. 5 with Maestro Jay Friedman. 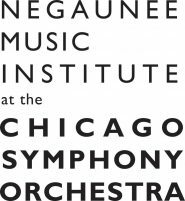 The CSO gave performances of the same symphony the weekend prior and the Civic Orchestra was treated to Terrace seats for one of the concerts — it was very inspiring for us to hear them perform! The weeks have been packed tight recently, but the fellows are a blast to be around and make the overall experience an absolute joy.